Rap eccentric Riff Raff currently has a lot on his plate. In addition to two potential albums, the rapper is currently training to wrestle in the WWE. With all of that on his plate, the rapper has also revisited last year's NEON iCON, allowing the legendary OG Ron C to chop and screw it. The resulting remixes will be available on PURPLE iCON. The release sees all 15 album tracks treated to Ron C's "chopped not slopped" style. 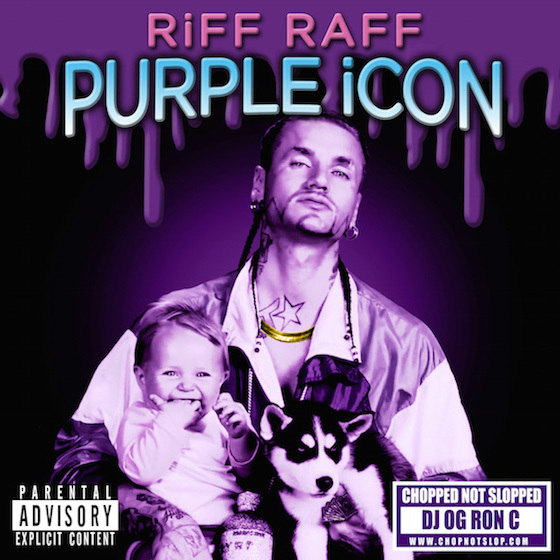 PURPLE iCON will be available on March 10 via Mad Decent. It'll arrive in a digital edition, as well as a limited physical bundle. The latter includes a purple cassette tape, a blacklight-friendly poster and Riff Raff socks. For now, you can listen to chopped and screwed versions of "Tip Toe Wing in My Jawwwdinz," "Wetter Than Tsunami" and "Time" below.